Type and Characteristics - Destroyer Gleaves-class DD619, built by Federal Shipbuilding and Dry Dock Co.; displacement 1,630 tons; length 348'4"; beam 36'1"; draft 17'5"; speed 37 k.; crew 270; armament 4 × 5 in (130 mm)/38 cal dual purpose guns, 6 × .50 in (12.7 mm) machine guns, 6 × 20 mm (0.79 in) anti-aircraft autocannons, 10 × 21 in (530 mm) torpedo tubes, 6 × depth charge projectors, 2 × depth charge tracks. Log Period and Areas of Service - 1942-46, Atlantic, Guadalcanal, Aleutians, western Pacific and the Philippines. 19 July 1942 - Launched and sponsored by Mrs. Edward Brayton, widow of Lieutenant Commander Edwards. 18 September 1942 - Commissioned, Lieutenant Commander W. L. Messmer in command, and served escorting convoys along the east coast and in the Caribbean. 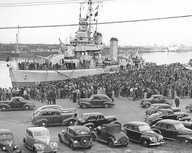 8 November 1942 - Sailed from New York to join TF.18 of the Pacific Fleet. 4 January 1943 - Covered a convoy bound for Guadalcanal. 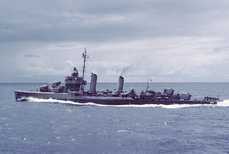 29 January 1943 - Convoy was attacked by Japanese torpedo bombers, sinking USS Chicago and damaging another destroyer. 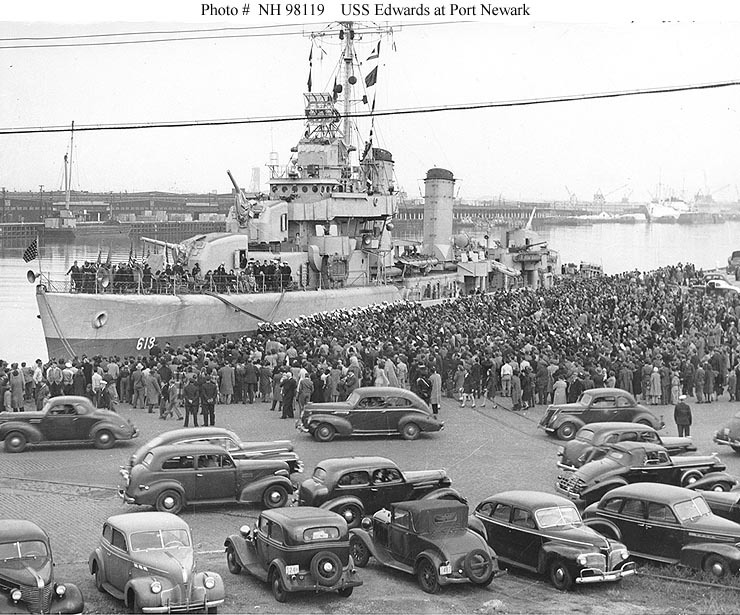 Edwards rescued 224 of the 1,049 survivors. 15 April 1943 - Set sail for the Aleutians. She saw action in April, May, June and August. October 1943 - She returned to Espiritu Santo, Vanuatu, supporting several actions. 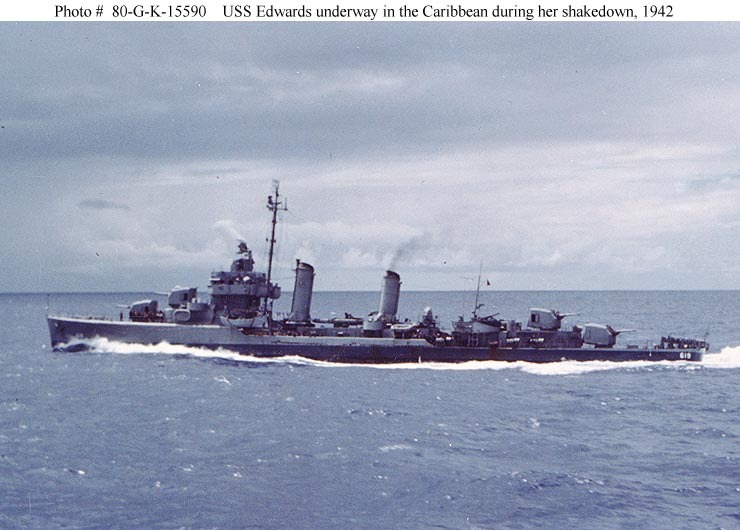 3 March 1944 - She arrived in the Marshall Islands, screening strikes and patrolling. 12 May 1944 - Edwards' destroyer division formed the Eastern Marshalls Patrol Group. 30 October 1944 - She arrived at San Pedro Bay, Leyte, for patrol. She remained in the Philippines, shepherding supply convoys. 16 September 1945 - She set sail for the states. 11 April 1946 - She was placed out of commission in the Charleston, S.C, Reserve. Fate - Decommissioned 11 April 1946 and placed in reserve, stricken from the Navy Register on 1 July 1971, sold on 25 May 1973 and broken up for scrap.